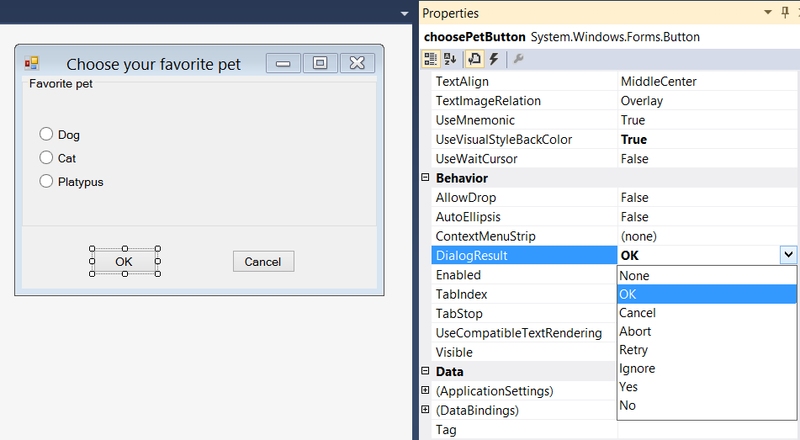 That makes the ChoosePetDialogForm “return” the value DialogResult.OK when called as a Dialog Box when the choosePetButton is clicked. Let’s say now that I want to make some validation before the Modal Dialog form closes, for example allow only “platypus” as favorite pet. How can I make the modal dialog to continue running after clicking a button? Well, as explained on the DialogResult Enumeration documentation, we simply need to set the DialogResult property value of the Modal form to DialogResult.None. This way the Modal form will not close. This entry was posted in .NET, C#, WinForms and tagged Dialog Box, DialogResult, Modal From, Windows Forms. Bookmark the permalink.